This is a gorgeous and versatile sleeveless wrap vest. 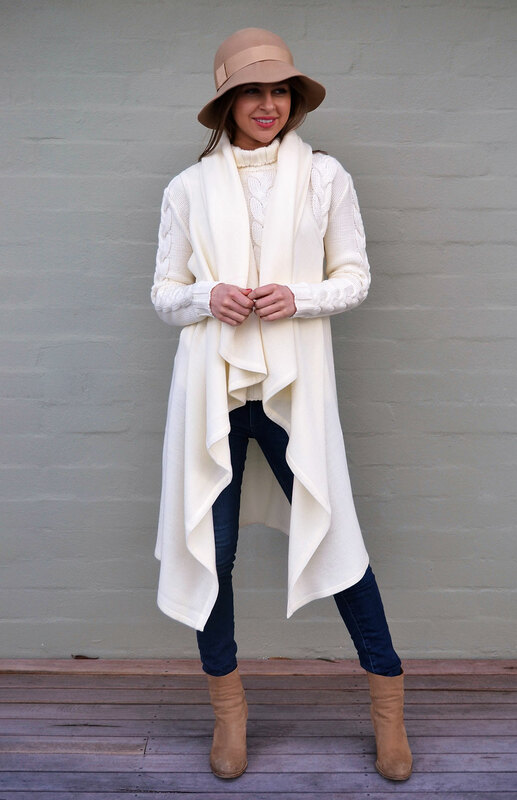 You can wear it so many ways, and it's made from a beautiful soft 18 micron 100% merino knit. It is actually wearable upside down- and even inside out if you wanted! You can even belt it and wear it as a coat-dress! Click here for a video outlining the many ways this can be worn! So many different looks - and a great travel option as it is really warm but lightweight. Great to layer over a Scoop Top. Happy customer, Bridget writes: "Wow! What a fab design. So many ways to wear it. It’s too much fun! All smiles here!"